Sony introduces WF-SP900 true wireless sport buds and £750 MDR-Z7M2 over-ears | What Hi-Fi? They sit at opposite ends of Sony's wide range of headphones. 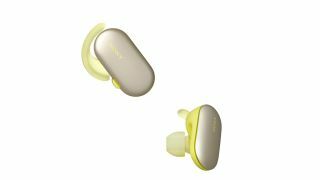 Sony is responsible for our favourite (and Award-winning) true wireless buds, the WF-1000Xs, so needless to say we’re excited by the news that the brand is releasing a sporty pair. The WF-SP900s follow in the footsteps of the WF-SP700N and are designed to be used across a wide range of sports - including swimming - thanks to their IPX5/8 rating, which allows them to be plunged to a 2m depth. Their resistance to salt water makes them sea-friendly, too. Naturally, the buds play music from a device over Bluetooth, however they also have 4GB of internal memory so, if you are taking a swim in the sea, you can leave your phone on your beach towel. Battery life is a pretty paltry three hours, although that can be bolstered by 12 hours on-the-go with the help of their portable charging case. By solely listening to songs stored inside the headphones, you get six hours from a single charge, with the charging case offering a further 21 hours. Controllable via Sony’s Headphones Connect app, there are two ways to listen in ‘Ambient Sound Mode’: ‘Normal’ lets you hear everyday sounds while you listen to music in the background, while ‘Voice’ promises listening without distraction but doesn’t let you miss announcements. You don’t need an app for basic playback controls, however. The Sony buds feature touch and button controls to pause music, change volumes and skip songs. The WF-SP900s will be available in November in black, white and yellow, priced £250. At the opposite end of Sony’s headphone spectrum you'll find the new MDR-Z7M2s, which are the successors to the MDR-Z7 model. They inherit some of their predecessor’s features, such as the Fibonacci-patterned grill (stiffened with resin to minimise sound damping), but build on their engineering. The MDR-Z7M2 use a newly-developed 70mm HD driver unit adapted from the MDR-Z1R, with an aluminium-coated liquid crystal polymer diaphragm that has been upsized and its optimised for the best sound quality possible. Also in the name of better sound is ‘Beat Response Control’, a special acoustic port on the housing that controls airflow behind the driver and optimises driver movement when reproducing bass. The Z7M2 comes with two headphone cables – a standard unbalanced cable and a balanced connection cable – and will be available from October for £750.